Digital Marketing Metrics: How Deep is the Rabbit Hole? There is an entirely alternate reality online and we as marketers struggle trying to understand what is real and what is illusion within our marketing programs. Do likes matter? Do clicks matter? Do follower counts matter? Does cost-per-click matter? Does watching 7 seconds of a 30-second video matter? How do you measure social media and digital marketing success? This is a big question that comes up a lot in marketing. I’ve seen clients at small businesses and big brands all struggle to feel confident in the effectiveness of their marketing and in its measurement. The truth is they all know the answer to this question but feel compelled to find a better answer. They’ve heard what tools there are to measure success, what key performance indicators they should look at, what their benchmarks are, and what the metrics are. So yes the truth is we all know the answers to these questions, the problem is that these are the wrong questions. Before I elaborate on the right question, let me give you a simple example and a complex example that demonstrate why it’s the wrong question. Secondary Indicators: All the metrics we pay for to see if you moved 1 or 2 points on a scale vs last year. And yes there are plenty of tools and research companies and models to help you figure out if these metrics are being hit each month, but for some reason with all this amazing information we still can’t turn a failing company into a winning company. We can’t even keep a winning company winning with any level of confidence. What’s more interesting is that smaller companies are too busy fixing their company to invest in marketing or worry about doing it right. And bigger companies are too big to change anything in the company that matters to keep them relevant. Yet they look to marketing to save the day. Unfortunately, the ad agencies and marketing organizations are rewarded for small incremental revisions and rebuked for risk taking ideas. When you look at companies that continue to make the same mistakes, it’s not a matter or intelligent or passionate executives, it’s often more about misdirected attention. I’ve worked with some of the most amazing minds from heads of ad agencies to C-level execs and I’ve seen that the brain power exists at many levels. But the culture of publicly held companies is defensive in nature and that limits the true power of the brands and the marketing. Yes there is a right question, or even many right questions that can lead to better digital performance, better marketing performance, and better sales performance. A friend was asking the question, what’s the better judge of success? Is it outcome or effort? My answer is technically outcome. But so many marketers have “successful” outcomes against the goals they set but still aren’t turning their businesses around. Why is that? For me, this always maps back to your goal setting. You have to set the right goal to change your business. Outcomes and effort are great but if they are misdirected away from the right goals, you won’t find success. So the right question is… What are your goals and how do you map your actions to those goals? Not just your main goals, but the goals for utilizing every asset to improve your business. This includes people, company assets, marketing channels, and ideas. Each of these should have a goal. For my sports fans out there, what’s the magic formula to be the best team in a professional sport? Is it to properly measure your teams game time performance. No, anyone can do that. The magic formula is to set the right goals for the team and every function that contributes to it’s success such as the team mindset, the player selection, the physical training, the game time strategy, etc. It’s not just about having the best player in the league… though it helps! You need a star player, a great coach, supporting players, aggressive training, common purpose, a principled system, chemistry, and the right strategy every day. I’m happy to give a simple answer on how to measure success in digital marketing. The best way to measure success is to constantly and actively test new hypotheses to see how they drive your bottom line. There are so many variables in marketing that you have to always be testing new things. Even your objectives and priorities should be pressure tested. What if you were focused on product messaging but you should have been building your email database. Or what if you were telling a brand story but the customers only care that your bathrooms are clean or that your store is in a desirable location. What if you are telling a value story, but the customers only care about cultural relevance and would pay more if their favorite celebrity endorsed you. There are a million scenarios, but the point is to test your ideas out with your customers. I can even help you prioritize. Here’s my priority list as the imaginary CMO of your company. 1. Start with your owned assets and look at what you can do to 2x or 10x their effectiveness. Things like your website, your social profiles, your online listings, your archived content, your email list, your text list, and in some cases the personal brands of your top employees. 2. Create more owned assets. Look at what other people have that you don’t. Do you need new technology, new processes, new packaging, or new media outlets at your disposal. Think of yourself as a media company and you’ll see that there are a million new places that you could be testing today and building a footprint. Create content, create ownable events, create news, create experiences, create channels, create more intellectual property. 3. Tell your story. Test your story. Adapt your story. Now tell it 100 different ways to 100 different people. Now create 3 different test for each of those different communications. If you think this sounds crazy, then you’re missing the point. A brand is like a person. Each person that meets you likes or dislikes you for a different reason. You need to find common ground and an emotional connection to start a relationship. You can be consistent with your values, but your communication should be as variable and adaptive as human communication is. 4. Engage with your community. Just like a store owner is out there shaking hands with the customers and sponsoring little league teams, a brand needs to be active in engaging within their marketing programs. Start with being responsive. How many people are starting conversations about your brand or directly with your brand’s social media or CRM channels that are going unanswered. Now think of how many more people are talking about things in your industry where you could join the conversation, engage and add value. Even the best brands are just dipping their toes in one-on-one engagement and getting massive PR bumps. This is just the beginning. 5. Leverage connectivity between your channels and understand what role they each play in bringing you customers. And then test those roles. What if you are using radio to push product messaging but you should be pushing email signups. What if you are using your email as a coupon play but it should be a private list for event promotion. Or what if your website is about products and store locations but it should be a media & content hub. Find out what customers would be interested in from you and give it to them in fun and different ways. I know these aren’t the answers you’d expect to hear for a simple question like how do you measure success with social media and digital marketing. But that would have been so boring! There are some best practices you can google for measuring ad performance or you can talk to marketing experts to get responses customized to any specific business situation. I hope I inspired some creative thinking and dialogue. Check out my Free Online Branding Checklist to get tips on how to get your business found online! Brandon Birkmeyer is the host of the Brands on Brands on Brands Podcast. I believe that building brands that matter today is the only way for a business to thrive tomorrow. Brands that are true to a purpose. Brands that put people first. Brands that build real connections. 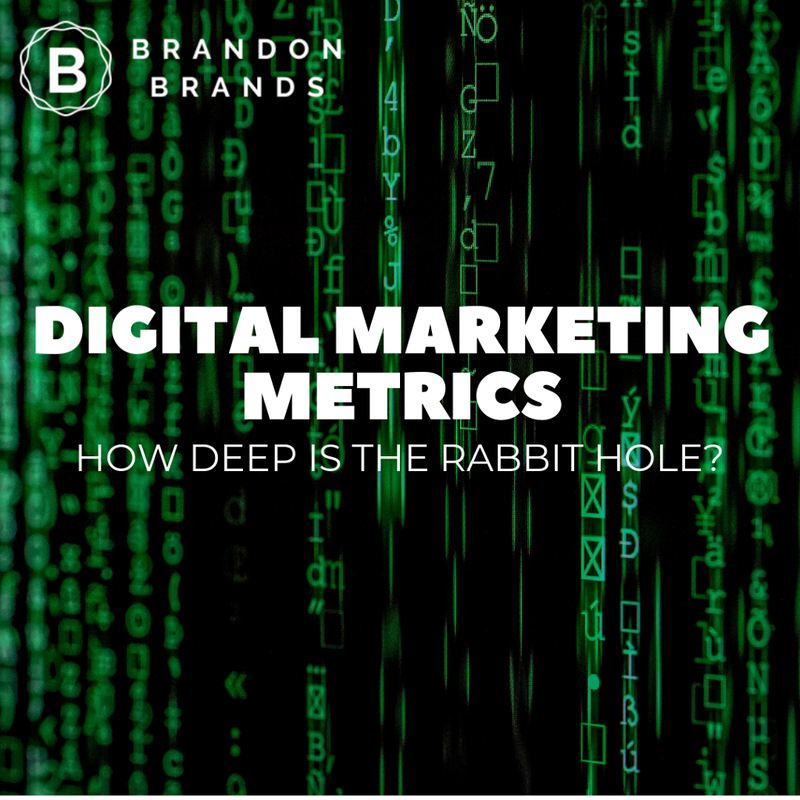 Digital Marketing Metrics: How Deep is the Rabbit Hole was originally published in Marketing And Growth Hacking on Medium, where people are continuing the conversation by highlighting and responding to this story.